Sometimes, I just feel like tacos. 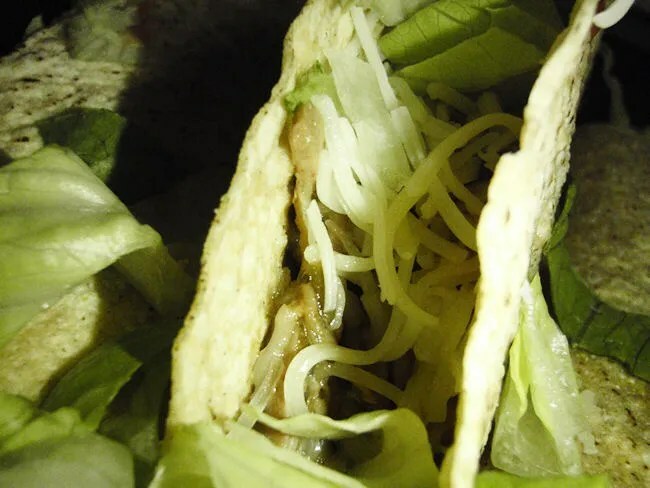 Not real tacos or anything, but just the tacos that the Mexican chain restaurants offer. I kind of go back and forth between Chipotle and Qdoba and since there’s a hidden Qdoba close to where I work, Qdoba won out for dinner. I say “Hidden Qdoba” because the Qdoba in downtown Grand Rapids is one you could drive right by and not even realize it. Unless you know it’s there, you’ll never find it. The address is 25 Michigan which is a pretty prominent building on the Medical Mile. The Qdoba is part of the food court at 25 Michigan. There’s no signage or any indication from the street that the Qdoba is actually there. 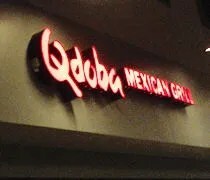 In fact, it’s not just Qdoba. There’s also a Smashburger and a Zoup! The downside to this location is you pretty much have to park in the parking garage attached to 25 and 35 Michigan. If you dine in, you’ll end up paying a few bucks to park. I got lucky on this trip due to the fact I was in and out in less than ten minutes. When I stuck my ticket in the machine to pay, it kicked it back out at me and said I didn’t owe anything. 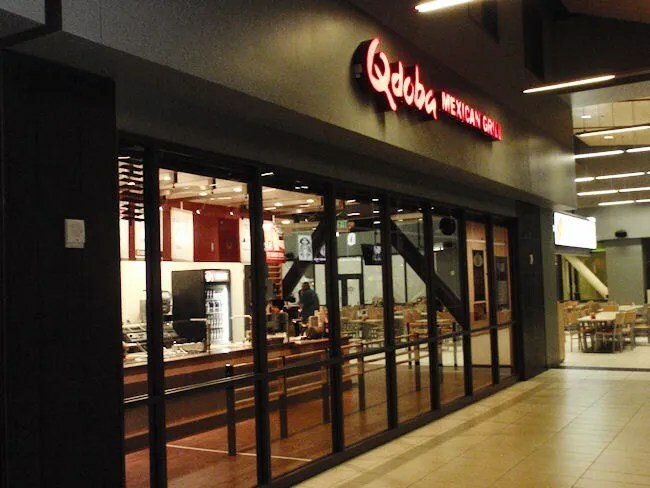 The Qdoba is the first of the three restaurants you’ll see when you come down the hall from the elevators. All three restaurants share a cafeteria style dining area. It’s kind of set up like a mall food court. Each restaurant has their own space, but after getting your food, you go to a common area to eat. I wasn’t sure how late they would actually be open, so I was happily surprised when I walked in a little after 7:00 and they were still open. For some reason, I was thinking because of their location, they closed early or something, but they’re actually open to 10:00 Monday through Friday and 9:00 on Saturday and Sunday. I didn’t stray from my usual Qdoba order. I got the usual three pulled pork tacos with lettuce, cheese, and hot salsa. 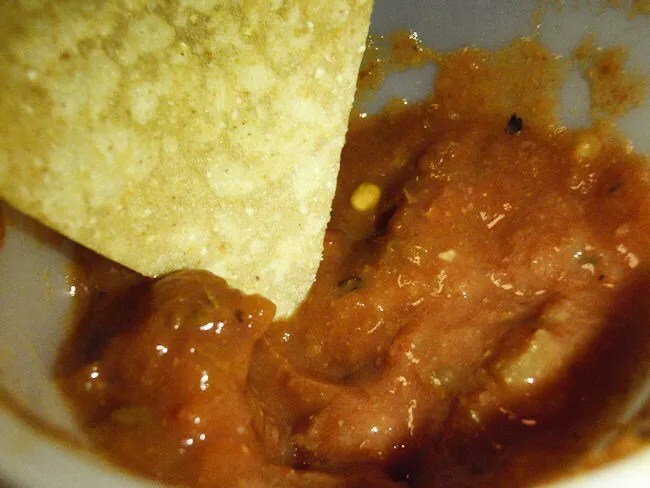 I then added on a bag of chips and more hot salsa. I should have went for the queso, but I wasn’t really paying attention. I just ordered out of habit instead of actually thinking about what I wanted. The bill was a little over $9 and that didn’t include a drink. The tacos were packed up in a plastic box and the chips were shoveled into a bag. I needed to get back to work, so I took everything to go. I tore my way through the tacos first. I went with hard shell tacos over the soft shell. The pulled pork is always juicy and tender. The hot sauce has a little kick to it, but it’s not knock your socks off hot. The chips rounded out the meal and for a big eater like me, it’s the only way to go at Qdoba. The tacos on their own are not filling enough, but add on the chips, and you have a complete meal. As I’ve said in other blog posts, Qdoba is what it is. It’s not authentic Mexican, but that’s not what I wanted. I wanted delicious fast food tacos and that’s what Qdoba delivers.